Garage Doors are at risk of falling if the rollers have come out of the tracks that guide them. If your garage door comes off-track, stop operating it promptly. Meanwhile, if you continue to operate the door, it can cause significant damage. Call a professional garage door technician to put the door back on track and replace necessary door panels and other parts such as roller or springs. A garage door can fall off-track for a few reasons such as, time and wear have worn down cables, a spring has broken, the rollers have worn down to the point that the track no longer can hold them in or the door has been closed on something. In addition, someone may have accidentally run into the door forcing it out of place. If your garage door has fallen off-track, do not attempt to reset the door alone. There are many components to a garage door that can be dangerous and its not recommended to reset alone. Call now for a free estimate at 541-203-7676! Warning: Do not adjust the bottom bracket of the garage door. This connects with the spring system that operates the door, the spring is under extreme tension. If you loosen the bracket, the tension spring can cause severe injury. Contact a professional if your garage door has an issue near the bottom of the track. First, confirm the tracks are still anchored in place. Often, garage door rollers come off track due to the fact that the track has come off the wall. Second, tighten the brackets with a wrench if they are lose. Absolutely, do not take the bottom bracket off. Call an experienced garage door technician to perform this job. It is equally important that the tracks are free from dents and damage prior to reinstallation of the garage door. Additionally, a large dent will cause the overhead door to come off track more easily. Use a rubber mallet and a piece of wood to hammer out serious dents. When there is a lot of damage to the track then you will need to replace the track. Typically, the tracks are not worth the effort to repair. With this in mind it is best to replace the track as they can present a serious safety hazard. Specifically, you use a level to assure the tracks are properly aligned. Additionally, check that the tracks are evenly aligned at the same height on both sides of the wall. It is important to realize accumulated grime and dirt on the track can cause the door to come off-track. For this reason a yearly garage door maintenance will keep your door running smoothly. Your garage door needs to be lubricated to ensure proper function. Once a year maintenance needs to be done to ensure your garage doors are running smoothly and safely. 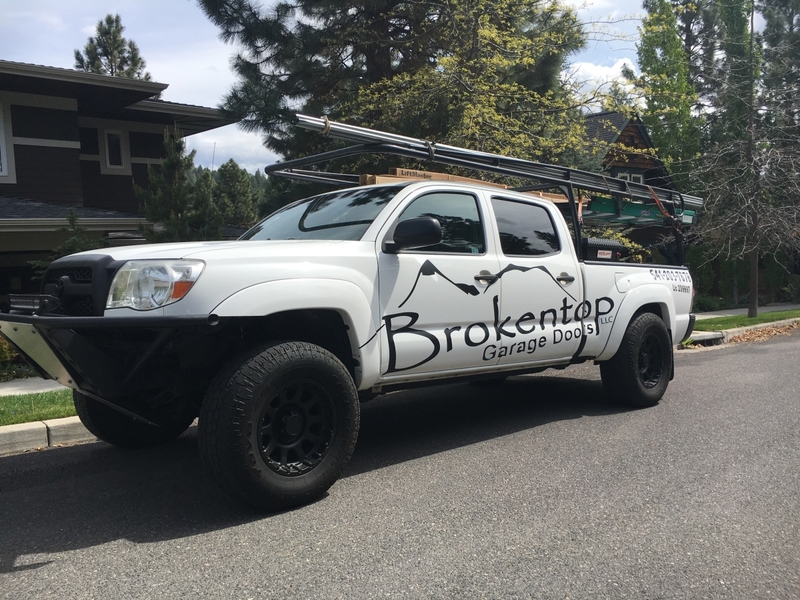 On the positive side Brokentop Garage Doors can perform a 20 point check once a year to ensure proper function.